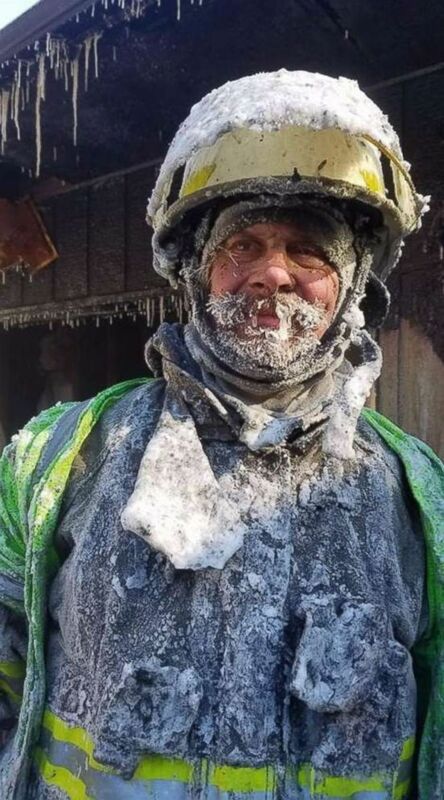 At least eight people have died as a result of the coldest weather in decades across the Northern Plains and Midwest over the past few days. In addition, college classes have been cancelled, airports were brought to a standstill and as much as 3 feet of lake effect snow is possible in upstate New York. The weather wreaked havoc on transportation across the northern U.S. Amtrak Midwest corridor service will remain closed on Thursday, though officials do plan to resume long-distance service. Ground stops were put in place for extended periods at Newark, LaGuardia and JFK airports. The Illinois State Police said 10 times as many stranded drivers needed to be assisted as on a normal winter day. 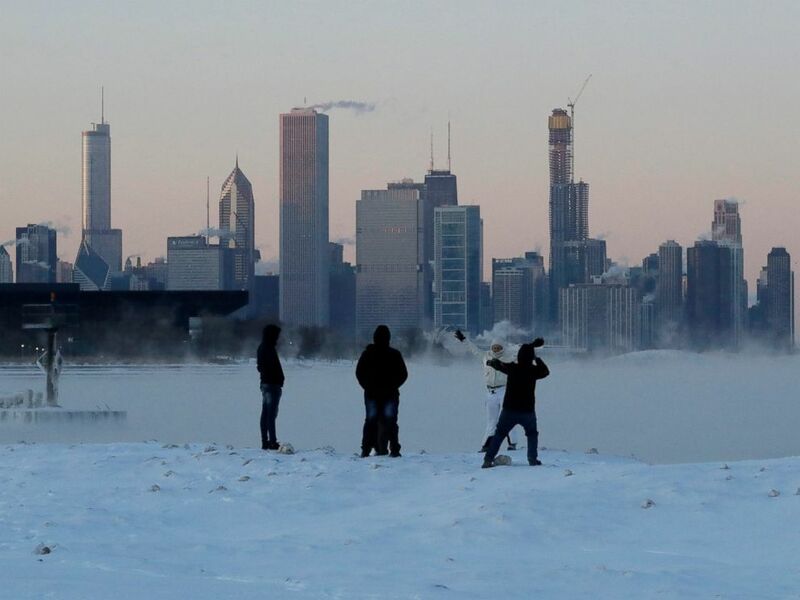 The wind chill in Chicago got down to minus 52 on Wednesday — the coldest wind chill since 1985. It was minus 55 in Minneapolis, also the coldest wind chill since 1985. Wind chills in western New York got down as low as minus 38 degrees overnight. 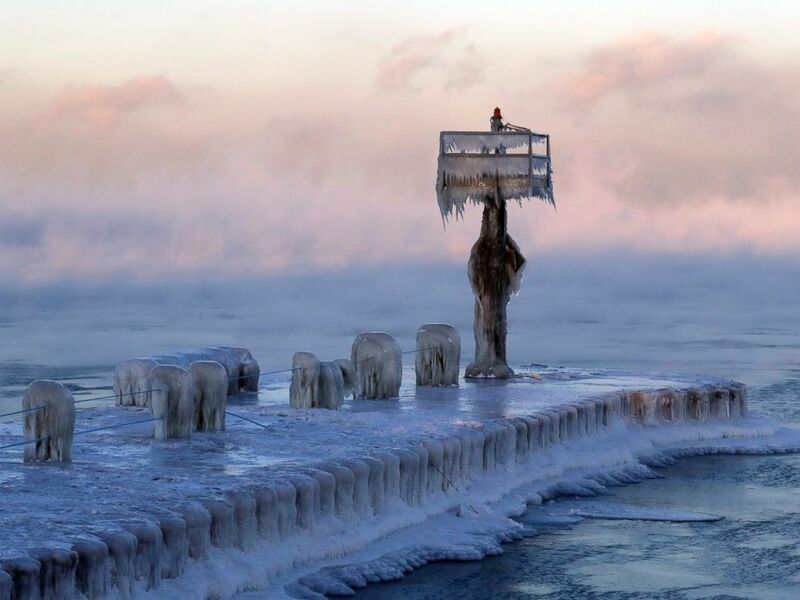 Arctic air moving over the frozen Great Lakes produced feet of snow, including nearly 20 inches in Buffalo and several feet in Oswego and Watertown, New York. It was as low as minus 3 degrees in New York City on Thursday morning, the coldest temperature so far this season. The last really cold day of this spell will be on Thursday. There are 29 states under cold or snow alerts on Thursday. 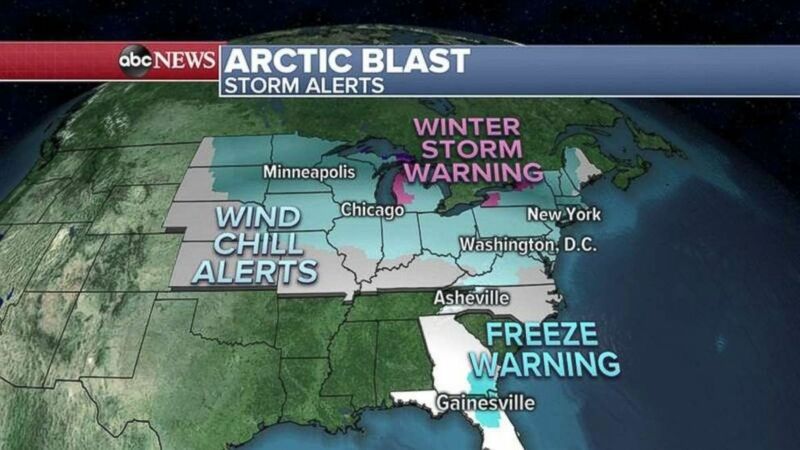 There are 29 states under snow and cold alerts Thursday morning from the Dakotas to Florida and up to Maine. 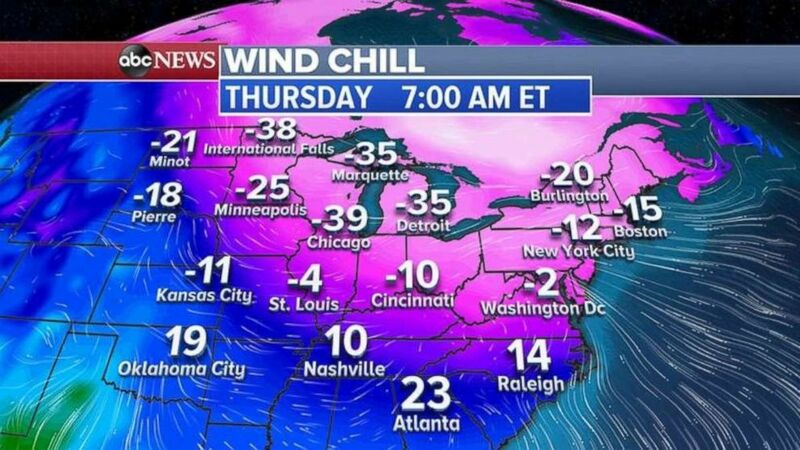 Wind chills are brutal on the East Coast early Thursday, down to minus 14 in New York City, minus 15 in Boston and minus 1 in Washington, D.C.
Wind chills are still 20 to 30 degrees below zero in the Midwest and 10 to 20 below in the Northeast. The core of the coldest air reaches lifts back to Canada by Friday, but wind chills are still going to be very low — below zero from Chicago to Minneapolis and to Boston. Lake effect snow will continue in western New York state — due to the arctic air continuing to pass over the Great Lakes — with an additional 1 foot or more possible on top of several feet that fell Wednesday. 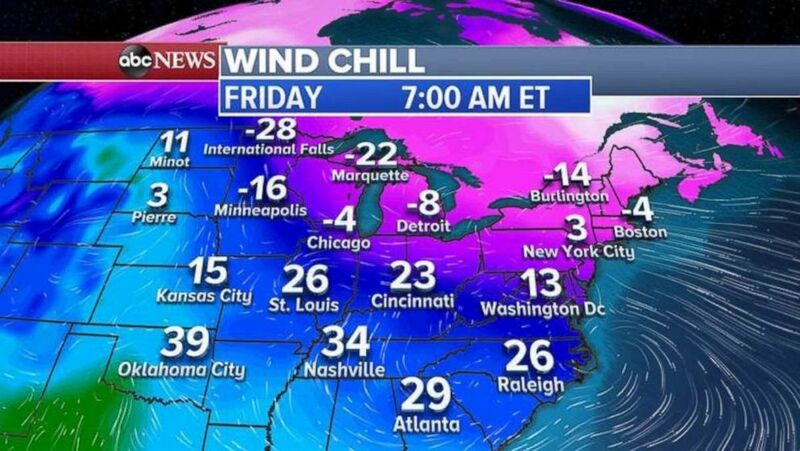 The wind chill will be below zero in the Midwest and New England on Friday morning.